Clear definition and respect of property rights is among the cornerstones of a free society. Remove private property rights – people think that everything is owned by everyone – and society can quickly degenerate into chaos, robbery and looting. As an advocate of free market and less government (but not zero government, I am not anarchist), I believe that private property rights, both physical and intellectual property rights (IPR), should be respected. And this is my debate with other free marketers but do not believe in respecting IPRs, who think that all forms of IPR should be abolished. There are different types of IPR: trademark, copyright, patent, trade secrets and industrial design rights. For this brief paper, I will just focus on trademark and partly, patent. So when someone will use a Mcdo (or Chowking, or Jollibee, Figaro,...) trademark and logo, then use that logo in his new food shop to attract many customers while selling adulterated or expired or plain lousy food, there is deception of the public. Disrespecting the trademark and IPR of those fastfood chains – and all other companies from other sectors– to have exclusive use and right of their trademarks and logo is harmful not only to other enterprises in a market economy, but also to consumers. A trademark represents the firm's unique identity. People will patronize or boycott a firm's products and services based on the perception they have made or heard about that company's quality of products. Trademark, patent and other IPR forms force people and companies to become creative and develop brand loyalty among customers. It took many decades for McDo, Jollibee, Starbucks, Figaro, etc. to develop their corporate brand, now people have liked their products, services and corporate brand. If IPR like trademark is abolished, then all the lazy and envious businessmen will jump and use those trademarks developed for many decades to attract customers even if they did not spend a single centavo to develop such brand. 1. If I launch a large media campaign with the slogan "McDo Bulok," will this be a property right violation as well? Am I legally liable under the property rights framework if I photoshop perverted things on the Golden Arch 'M' sign, and post these images online? 2. If you take it with the Japanese, they don't care too much about IPR, their companies are busy continuously innovating and improving product designs. In an engineering standpoint IPR is just a paper work to be shelved to obsolesence. 3. Trademarks are needless and irrelevant to business success. 4. 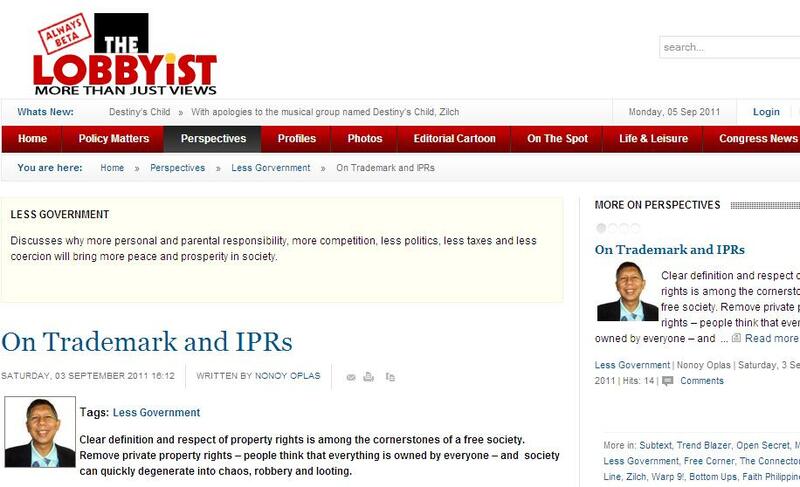 ‎The only way to abolish IPR is not thru legislation. Innovation, continuous improvement, new inventions and processes will. A great example is the idea of free softwares. On #1, I believe that one can launch Mcdo Bulok, Jollibee Bulok, Figaro Bulok, SM Bulok, Facebook Bulok, etc. It is their right, using their own money and time, and I don’t think there is any IPR violation there, only corporate attack, which happens anytime, anywhere. If one will use perverted things on the Mcdo logo, Jollibee logo, Ayala logo, etc., then post them online, I don’t know if those companies will bother spending time and money to bring him to court. But if one will put up a burger store and use the entire McDo or BK or Jollibee logo, that I think will constitute trademark stealing and one can expect legal battle. One alternative is to name their food store as plain MCDO, or MagDo, or MagDobedo, or MacMac, etc. I think there is no trademark stealing there, no IPR violation. Then they can aspire to make their store develop a good corporate image and brand. The IPR system forces people and entrepreneurs to be really creative. I think Jollibee will never be successful if its name was MacBee or Jollinald. By having an entirely different brand, entirely different trademark and logo but offering almost similar products (burger to spaghetti to fries), Jollibee has cultivated its uniqueness. IPR abolition is for the lazy and envious businessmen. On #2, Yes, the Japanese do not talk too much about IPR because they take it as a given and to be respected. For instance, Mitsubishi or Isuzu did not simply call their company as a generic "motor company". They used their name, developed their own brand, worked hard to make it different from Toyota or Nissan, different from Ford or GM, different from BMW or Benz. Their unique trademark and corporate brand defined the uniqueness of their vehicles and motor parts, and customers like it that way. On #3, I cannot think of any big and successful company which has no trademark and just a generic name like "IT company" or "burger company" or “coffee company”.The purpose of having a trademark and corporate symbol is to assert that enterprise’s uniqueness in relation to other manufacturers and suppliers of similar products and services. On #4, Endless innovation does not abolish or disrespect IPR. Rather, it affirms it. As I pointed out above, there is no innovator company which has no trademark. Facebook, google, youtube, yahoo, twitter, linkedin, etc., they ALL offer free social networking. They practically slash each other's throats attracting more subscribers away from each other whenever possible. In pharma industry, ALL innovator companies have their own distinctive trademarks, all have their own patents for both successful and unsuccessful or failed molecules discovered. And ALL generic companies also have their own trademarks, like Unilab, Pascual Lab, Pharex, etc. And all of those generic companies respect and support the patent system, none of them ever campaigned for the abolition of IPR and patent, they only want shorter patent life via compulsory licensing and related schemes. An IPR is a mini-monopoly. Starbucks, Figaro, UCC, McCafe, Seattle’s Best, etc have their individual trademark and hence, individual monopoly. Who has monopoly for the entire coffee shop industry? None. The granting of mini-monopolies to each player is conducive for more players to come out and introduce their own brand of innovation and business creativeness. And as far as I know, not one of the new important players complain of such mini-monopoly via trademark. What they do is create their own trademark, their own mini-monopoly and enter the market and challenge the incumbents in attracting customers. 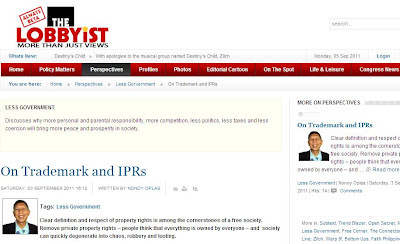 In short, the abolition of all forms of IPR is wrong. I often wonder why so many free marketers fall for this infantile proposal. Instead of pointing their energy on questioning BIG governments and their big coercion and deception, they turn their guns and energy on private enterprises that only want to assert their uniqueness in a sea of so many private producers and enterprises worldwide.